Porec is west coast of the Istrian peninsula, the city is among the most popular Holiday destinations in Istria, and the hotel offer in Porec can only be matched by Dubrovnik and Zagreb. Hotels in Porec can be found ranging from small family run hotels to large wellness and luxury hotels with excellent facilities. With close to 500 beds, Hotel Valamar Diamant is among the largest Hotels in the Porec, the facilities and the entertainment program at Valamar is impressive, among other the Hotel has and excellent wellness area. So the Valamar Diamant Hotel is hard to beat. Enjoying prime position on a tranquil pine-covered coastline, and within a ten minute stroll of the charismatic centre of Porec, the hotel combines beauty with plenty of relaxation opportunities. Quality time begins in one of the almost 250 the bright rooms and spacious suites where modern design, soft tones and fragrant surroundings conspire to reduce stress to a distant memory. Fresh ingredients and Mediterranean flavours are the hallmarks of the Valamar Diamant Hotel’s acclaimed restaurant, which showcases mouth watering selections of Istrian and international specialities. Hotel Plavi in Porec is the right choice if you are looking for an ideal combination of quality services and affordable prices! Enjoy all the benefits of the Plavi’s location right next to the beach, in the centre of things within the well equipped Zelena Laguna holiday resort. In addition to the hotel’s attractive entertainment and leisure programmes, there are various sports centres and catering establishments. Food lowers will particularly enjoy the bountiful buffet table, where we offer free drinks. If you happen to find yourself in the early evening near the huge glass windows that look out onto the sea or the terrace, you will be spellbound by the fiery colour of the sunset. Hotel Valamar Crystal one of the top hotels in Porec, the hotel is one of the hidden treasures of the Croatian coastline, the Valamar Crystal Hotel is tucked away on the Western coast of the Istrian Peninsula within a 10-minute stroll of historic centre of Porec. At Crystal guest are offered a wide range of activities during the day, some of them organized as part of the daily animation program, other guest can arrange on the own hand, e.g. by visiting the large sports centre or the wellness facilities at the neighbour hotel Diamant. The Hotel offer a rich assortment of Mediterranean and international cuisine is beautifully presented in the show-cooking restaurant. For those how dream about spending the Holiday in peaceful surroundings on a small island, Hotel Fortuna Island in Porec if for sure a destination to consider, the Fortuna Island Hotel is superbly positioned on the tiny island of St. Nikola, with great views across the sparkling Adriatic to old town and Promenade of Porec, the surrounding pines and pristine beaches provide a glorious setting for an unforgettable holiday. 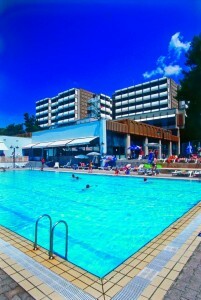 The newly renovated Hotel Mediteran is located just 2 km or 15 minutes of walking distance from Porec. The Hotel offer an impressive range of facilities including indoor and out door pool as well as a nearby sports centre, where tennis, mini golf and other sports can be exercised. The evening program and entertainment by the pool is a special experience, during the day there is of course also lots of activities on the program, for adults as well as children. If you decide to stay in the Hotel Mediteran, you can rest assured that here you will find warm welcome and peace and relaxation in the cedar and oak wood right by the sea. The newly refurbished 4 star Hotel Laguna Molindrio is situated in the holiday resort Zelena Laguna which is about 4 km from the city centre of Porec, the 265 hotel rooms has modern interior. The outside facilities include two outdoor pools and a children’s pool, the beach can be found 300 meter form the hotel. The sports centre offer a wide range of sports facilities, like tennis, football, mini golf additionally it is possible to exercise water sports like e.g. windsurfing. The entertainment and activity team at the Hotel Molindrio offers various sports, activity and fun programs during day and evening. 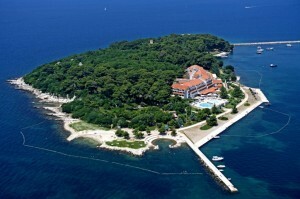 Few people are aware that Porec has some very special hotels to offer, one of them is a castle situated on a miniature island just a few hundred meter from the promenade in Porec. Hotel Isabella Castle is a small Hotel offing only a limited number of rooms / apartments.From the elegant apartments, manicured lawns roll out to a lush curtain of palms, pines and olive trees, beyond which lie a string of beautiful beaches sloping into crystal clear waters. A few steps across the island and you’ll find the Fortuna Island Hotel, where a delectable selection of dining options await. Very close to the city centre in Porec, the small Hotel Hostin can be found, the Hotel offer 39 air-conditioned, comfortable rooms with bathrooms, telephone, internet link, SAT-TV. Each room has a balcony. The hotel comprises a restaurant, bar, coffee room with a nice spacious terrace, congress hall with 70 sitting places, a meeting lounge with 20 places, indoor swimming pool, whirlpool, sauna, Turkish bath and fitness studio, Beauty center. All areas are heated and air-conditioned. The nearby beach has been categorized with “blue flag”.